I first tasted this delicious home made pizza when my friend Lisa made it for me around this time last year. It was so flavoursome and best of all, affordably priced and quick to make – just the ticket when having people over. Having enjoyed a winter-full of soups, casseroles and slow cooked meals, lately I’ve been craving lighter and greener dinner options, and this delightfully healthy pizza, originally from Good Taste Magazine, fits the bill exactly. And since some lovely friends served up a very similar dinner when hosting us for dinner last weekend, once again, I’ve got the taste for dinners such at this! Do feel free to fiddle with options for topping (we love it with the addition of mushrooms) and if making for more than 4, simply multiply the number of bases needed to cater for half a large flatbread per adult. 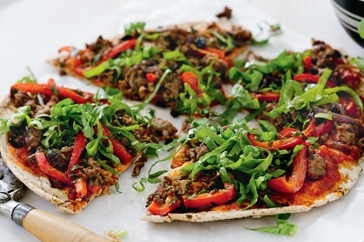 One last tip when making home made pizzas like these: flatbread labelled Lebanese Bread is half the price of anything similar that’s labelled as a pizza base – and the taste of the finished product is much the same. This easy, yummy affordable and healthy dinner will set you back less than $7. Preheat oven to 220°C. Heat 2 large baking trays in the oven for 10 minutes. Meanwhile, heat a large non-stick frying pan over medium heat. Spray with olive oil spray. Add the onion and capsicum. Cook, stirring occasionally, for 4-5 minutes or until soft. Increase heat to high. Add the mince. Cook, stirring with a wooden spoon to break up any lumps, for 4-5 minutes or until the mince changes colour. Drain off any residual fat. Add the cumin, paprika and coriander. Cook, stirring, for 1-2 minutes or until aromatic. Remove from heat. Stir in the currants and parsley. Divide passata and mince mixture among bread. Place on the trays. Bake for 8-10 minutes or until bases are crisp. Cut each pizza into quarters. Top with rocket and serve with the yoghurt.